A thoroughly thought-through concept with the finest details… …forms the basis of the technological advances made in our VC machines guaranteeing optimal casting results whatever class of machine you opt for. 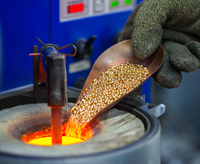 Au tomatic inert gas or vacuum in the melting chamber… …to avoid undesired oxidization or the formation of inclusions during melting, particularly important when casting silver or red gold. eliminates the danger of oxidation while the flask is cooling down. The Turbo Pressure function optimizes the casting of very small and filigree objects. 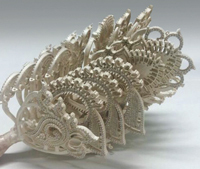 For the production of jewellery it guarantees perfect results when casting with stones. Turbo Pressure allows a precisely defined pressure to be achieved rapidly. For all program-controlled VC models, depending on the selected program the Turbo Pressure will start automatically exactly at the required time. The integrated data printer (optional for VC 500) records the para meters of every casting (ISO 9001). All machines with an induction generator can be remotely serviced via a GSM modem. The GSM modem enables Indutherm to remotely monitor and, if necessary, modify important parameters. This allows many potential operational disturbances to be detected in advance and hence avoided. If the machine isn’t working properly or a difficult casting procedure is being carried out, we can remotely provide quick and straightforward assistance. Highest levels of safety for certified production The digital or program control of our machines means we can ensure a high level of safety i.e. we can guarantee an ISO certified casting process. Until recently flasks with incorrect or different temperatures were a safety risk. During casting of very small or delicate parts the temperature of the flask is of upmost importance. The measurement of the flask temperature (standard for machines from VC 500D onwards) is an important feature with regards to safety. The temperature of the flask can be monitored to within one degree accuracy. The resistor-heated vacuum casting machine VC 200 and the vacuum pressure casting machine VC 300 are very low priced casting machines for smaller productions. Nevertheless these machines offer a convincing casting quality. 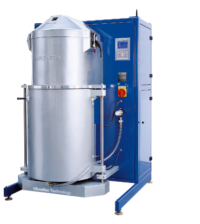 Both machines reach up to a maximum temperature of 1200° C.
The ideal machine for smaller companies which produce moderate quantities but require considerably more capacity than that offered by the MC machines. Often, experienced casters are not particularly interested in automated functions or program control, and they can achieve the same quality with the VC 400 machine as with more advanced ones. 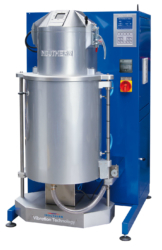 For larger production quantities with continuous casting operation, greater performance (shorter casting times) with even larger crucibles and flask capacities (flasks up to 160 mmm ø/400 mm H) is important. The high maximum temperature of 1600°C extends the possible range of alloys. Temperature measurements in both the crucible and the flask mean the temperature limits are strictly adhered to. If alloys are changed frequently, 16 different temperature programs simplify working procedures. The optional data printer records all the parameters of each casting (ISO 9001). The absolute „State of the art“-machine: the new VC 650 V garantuees highest efficiency – due to a maximum of rapidness and quality.